Veteran midfielder Seamus O’Shea is one of a few injury concerns for James Horan. EXPERIENCED MAYO MIDFIELDER Seamus O’Shea looks set to miss the rest of the National Football League with an ankle injury. O’Shea is understood to have sustained significant ankle ligament damage during a Mayo training session last week, and was not included in the Westerners’ match-day squad for last weekend’s defeat to Galway. 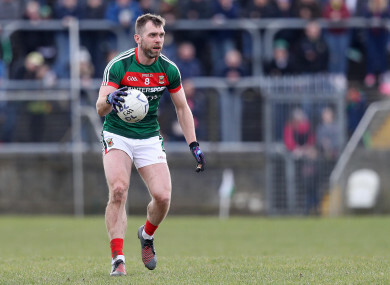 It’s believed that the 31 year-old Breaffy club man won’t be available to James Horan for Mayo’s remaining games away to Kerry on Saturday week next and at home to Monaghan on Sunday, 24 March. That would mean O’Shea’s next competitive outing for Mayo could be their Connacht championship opener against New York on Sunday, 5 May — in two months’ time. Defenders Ger Cafferkey (hamstring) and Paddy Durcan (quad), along with rookie forward Ciaran Treacy (ankle), also missed last Saturday night’s clash with Galway due to their respective injuries. But Diarmuid O’Connor did return to action having recovered from a calf problem, and captained the team against the Tribesmen. Cafferkey and Durcan are both expected to be back in the frame for a place in the Mayo squad that travels to Kerry for round six, while Evan Regan (shoulder) and Cillian O’Connor (knee) could also feature. O’Connor has been rehabilitating from knee surgery since before Christmas, but may be ready to return to play for Mayo’s final two regulation league games. However, Cian Hanley, who had a similar procedure carried out on his knee in December, revealed last weekend that he would not be ready to return to action before the end of the National League. The former Mayo minor captain, who was on the books of the Brisbane Lions for two years, made his senior championship debut against Galway last summer. Tom Parsons, who sustained serious leg and knee injuries in that same game, is continuing his rehabilitation programme and is said to be ‘making good progress’, according to James Horan. Email “Blow for Mayo as O'Shea set to miss rest of league campaign through injury”. Feedback on “Blow for Mayo as O'Shea set to miss rest of league campaign through injury”.